The country effectively runs out of money in five days and has agreed a plan with the Troika to receive a four-month extension to its bailout programme. 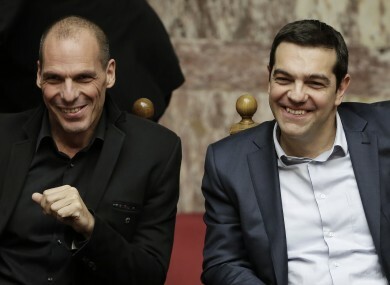 Finance Minister Yanis Varoufakis and Prime Minister Alexis Tsipras. GREECE HAS HANDED in its proposals for an extension of its bailout to the EU. Eurozone ministers this afternoon approved this extension, after Greece submitted a list of reforms. The country’s stocks have surged following the news. Greece’s €240 billion bailout ends on Saturday and without an extension, Alexis Tsipras’s Syriza government, swept to office on a wave of anti-austerity sentiment, would have risked running out of money. Analysts say that would trigger a run on Greek banks and a possible ejection from the Euro. Parliaments in several of the eurozone’s 19 member states including economic powerhouse Germany must now vote on the proposals by Athens, before Greece’s bailout expires on Saturday. The IMF has warned the reform plan lacks clear signs that the government will follow through on its promises. In a number of areas, “including perhaps the most important ones,” the letter proposing the reforms “is not conveying clear assurances that the government intends to undertake the reforms envisaged,” said IMF managing director Christine Lagarde in a statement. Our initial impression is that the document covers a wide range of reform areas and in this sense, it is sufficiently comprehensive to be a valid starting point for a successful conclusion of the review. The government wants to “work toward creating a new culture of tax compliance to ensure that all sections of society, and especially the well-off, contribute fairly to the financing of public policies”. This will include “robust efforts” to improve tax collection and fight tax evasion. The list sent to Brussels talks of implementing a “national plan against corruption”. This will involve cracking down on fuel and tobacco smuggling as well as money laundering, while keeping closer tabs on the funding of political parties and the awarding of public tenders. To underscore its determination, the government has created an anti-corruption ministry. In order to save money the government plans to improve efficiency across the board. This will include cutting the number of ministries to 10 from 16, reducing the number of “special advisors” to government and slashing “fringe benefits” of politicians and other top officials like cars and travel expenses. Spending will be reviewed “in every area of government spending”. In addition, the government aims to implement labour market reforms and achieve a “better business environment”. The programme commits to maintain privatisations that have already been completed and to “respect the process according to the law” where a tender has already been launched. At the same time, the government will review privatisations that have not yet been launched with a view to improving the terms and to “maximise the state’s long-term benefits”. The list includes measures to improve access to basic needs such as nourishment, health care, housing and energy though “highly targeted non-pecuniary instruments” like food stamps. Importantly, however, the government claims that its “fight against the humanitarian crisis”, as well schemes such as temporary work programmes for the unemployed, will have “no negative fiscal effect“. In the same way, the scope and timing of the government’s planned increase in the minimum wage — a measure that particularly alarmed creditors — will be made “in consultation … with European and international institutions”. Email “Here's what Greece is going to do in return for a bailout extension”. Feedback on “Here's what Greece is going to do in return for a bailout extension”.